First love and the lessons it brings about the crushing pain of heartbreak is a well filmmakers have been drawing from since the earliest days of cinema. However, when scripting painterly short The Light and the Little Girl, Director of Photography Jih-E Peng transposed the romantic love most oft depicted on screen with the story of a young girl who falls for the ephemeral beauty of the late afternoon sunlight. We talk to Jih-E Peng and director Guy Pooles about their collaboration on the film and how the pair worked together to capture the ‘girl’s eye-view’ of this burgeoning, delicate romance. The film came from an idea I had four years ago whilst lying on the floor of my living room. The Eastern light from my frosted bathroom window hit the ground and it was about the most beautiful thing I’d ever seen. As a DP, the first thought was: “I wish I could bottle that up and use it any time I wanted to on a film” – and from there the concept of a little girl who gets her heart broken for the first time sprouted. Once the idea was in place, I needed a director (I only ever wanted to shoot the film!). There was only one person I could think to direct the story, and that was the talented Guy Pooles. We had attended the same graduate school and he had the most incredible sensibility and gentle touch in everything he did. The big fear with the film was that it would get a little too ‘Disney-fied’ and on-the-nose; that fear went away the instant Guy agreed to do it, and we collaborated hugely on the script prior to production. He was by far one of the best experiences I’ve had with a director; you could trust him completely, and I absolutely did. It took about 3 years from conception to final sound mix and color grade to make the film. We mulled on it for almost two full years before finally getting the funds to create it. I sold my car to fund half of it; the entire film went into production with a 10k budget and was only possible because of the generosity of our vendors and crew, many of whom were close friends. It was shot in two real 12-hour days and I’m proud to say that we managed to get every single shot we had planned for, thanks largely to the seasoned crew, and especially to our producer and AD: Pin-Chun Liu and Allison Eckert, respectively. They were incredible and amazing support and we could not have been luckier for their efforts. I wish I could bottle that up and use it any time I wanted to on a film. Devising the visual structure of the film was easy in the sense that Guy and I were completely on the same page and never wavered from what the final goal should be. Every visual choice came from the experience of the little girl and what she was going through – if we were ever lost, it helped us to continuously break it down into seeing the beam of light as her first partner, and we’d use that to find the compositions that would represent that the most. One of the most important things we discussed visually was the immersive nature of the little girl’s experience. It was necessary that we discovered the light with her, and were let down in the same way by it. Having similar sensibilities, as well as the fact that we had the ability to talk about this for months, really helped when it came down to story-boarding and shot-listing. The actress in the film is the young Vivi Ann Yee, who blew us away in auditions. She really worked on Guy’s wavelength and was able to come away with a subtle and affecting performance that was really surprising and mature. Guy was very specific in what he was looking for going in, and the audition process was difficult – we had a small pool to look through, and not a lot of time to do it. Vivi Ann’s audition was immediately impressive, and Guy was sure of her casting the instant she left the room. 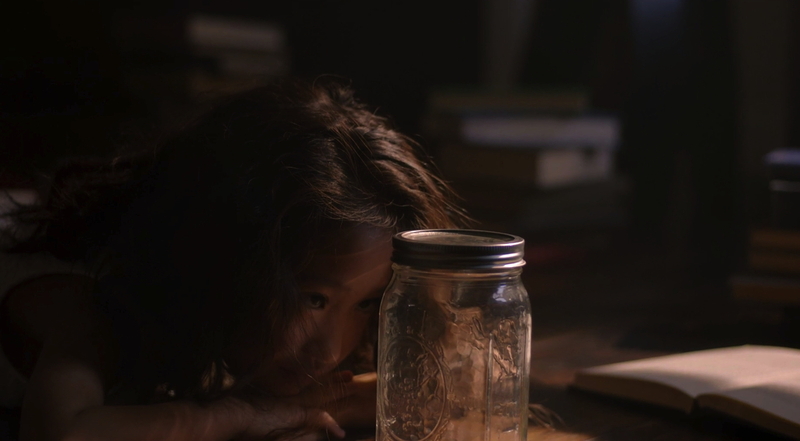 The Light and the Little Girl was shot in March on the Alexa with Zeiss Standard Speed primes, and our lighting package was completely provided by K5600 thanks to Joey Aman, who believed in the project and was extremely generous to the film. Primarily I used the Jokers transformed into Jolekos, as well as the Alpha 4K unit for ambient light. Gaffer Christopher Faulkner and key grip Gareth Paul Cox were the best department heads I could hope for, and we were all extremely giddy when we managed to get the shot of the light fading away as she clutches the jar, which was one of those ‘will it work?’ moments. Our Steadicam operator was the incomparable Nich Musco, who has the best instincts of any operator I’ve worked with, and without whom the film would not have been nearly the same. The edit was a collaboration between Guy and our wonderful editor Cyndi Trissel, and it came together fairly seamlessly so the film was completed by May. We were lucky enough to have James Welland on as our film composer, who knew Guy from childhood, and gave life to the film with the original score. It was the absolute simplicity of Jih-E Peng’s initial idea that drew me to the film. Within that image of a little girl trying desperately to capture a ray of sunlight, lay a truth about the naivety of childhood that was completely relatable. Curiously, I find it is often the simplest cinematic concepts that most honestly reflect the complexity of human nature. In my opinion the most satisfying cinematic experience, both as a filmmaker and a viewer, is a film that uses images to tell its story. 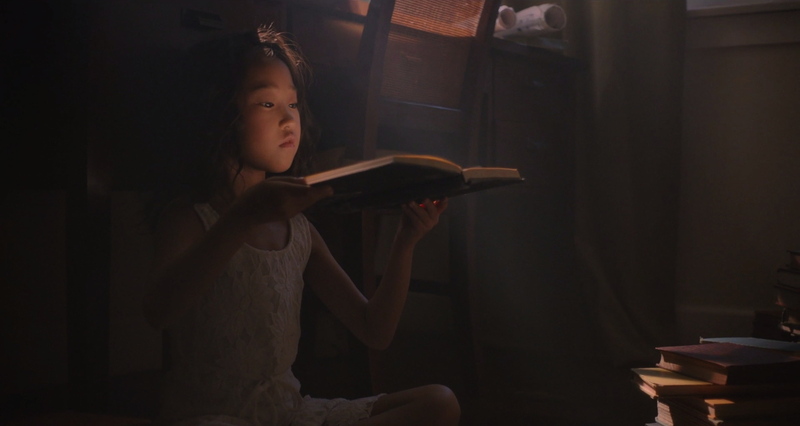 Having written a screenplay completely free of dialogue, Jih-E and I were faced with the task of constructing a visual language that defined the emotion journey of the Little Girl. Early on we had the idea to utilise the camera’s movement to convey the joy and excitement she experienced from interacting with the light. As her elation with the sunlight grows, the camera movements become larger and more pronounced. Then as the light dies away, the camera becomes deathly still, causing the viewer to feel the same absence that the Little Girl feels. The challenge here was to find ways to keep the camera moving that didn’t feel redundant. We often had the camera clocking around the Little Girl to reveal things to the viewer as she discovered them herself. As a lot of the action is played at floor level, our Steadicam Operator Nich Musco found that the most effective way to get low enough to the ground was to operate whilst sitting upon a Doorway Dolly. I find it is often the simplest cinematic concepts that most honestly reflect the complexity of human nature. The goal with the aesthetic of the film was to create a collage of colours and textures that evoke a feeling of nostalgia from the viewer. I talked with Haley Ho, the production designer, about how children often will perceive their father’s study as a sacred and mysteriously magical place. The goal was to create a study the felt more like a representation of how the Little Girl would have remembered it, rather then how it actually would have been. A huge influence on the film was the macroscopic, flowing, dream-like tone of the opening titles of Robert Mulligan’s To Kill a Mockingbird. Young Vivi Ann, our lead, was a remarkable discovery. The shoot was only two days and, under California Child-Labor Laws, our time with her was incredibly limited. Had she not been as professional, intelligent and mature as she was, I’m not sure how we would have gotten the film in the can. Upon preparing her for each scene or shot, I could feel her silently absorbing every syllable I uttered. Occasionally I gave a direction which I feared might be too complicated for her, but she would simply respond “Ok”, then go on to give me exactly what I’d hoped for whilst hitting her mark perfectly. She never showed signs of being impatient or tired, and the entire crew seemed to share my awe of her work ethic. You never really know how a child of her age will react to being on set, surrounded by people she doesn’t know, so when I think about all the different ways it could have gone had we cast differently, we really were fortunate to find her. Due to our time and budget constraints, Jih-E and I had devised a very specific shot list, allowing us to shoot only what we knew we needed. As a result, when I entered the edit room I assumed that there was only really one way the film could be pieced together. It is a testament to the skill of editor Cyndi Trissel, that she was able to find a far more emotive ordering of the images, whilst still utilising every shot. Lovely film, the girl is great.